Habitat: The plant is native to southern Europe and southwest Asia. 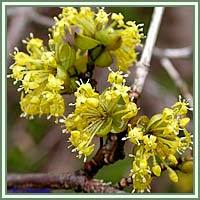 Description: European Cornel is a deciduous shrub, growing 5 to 12 meters tall. It has dark-brown branches and opposite, ovate to oblong leaves. Flowers are small, four-petaled and yellow. Flowering occurs from February to March. 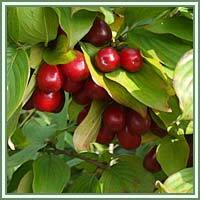 The fruit is an oblong red drupe, dark ruby red when ripe. Medicinal use: European Cornel was recognized as a medical plant from ancient times, mainly due to its astringent properties. Traditionally, European Cornel was applied in cases of fevers (bark, shoots, root) and diarrhea (fruit). Today, it can be used for various ailments: stomach aches and cramps, diarrhea, different skin infections, intestinal parasites and hemorrhoids.